If you’ve released a Windows Store app and you want to actually use the released version yourself on the same machine you develop the app on, running the dev version from Visual Studio may overwrite the real Store-installed version. As a workaround you can edit some files to change the package name so when you run it in dev it won’t override the store version. But you need to remember to change back when you release next version. A while ago I came across a post using various steps to achieve this but it seem a bit complex an involved additional targets, etc. So I hacked together my own utility: CohabitStoreApp. Check out the example app and the readme for more info. 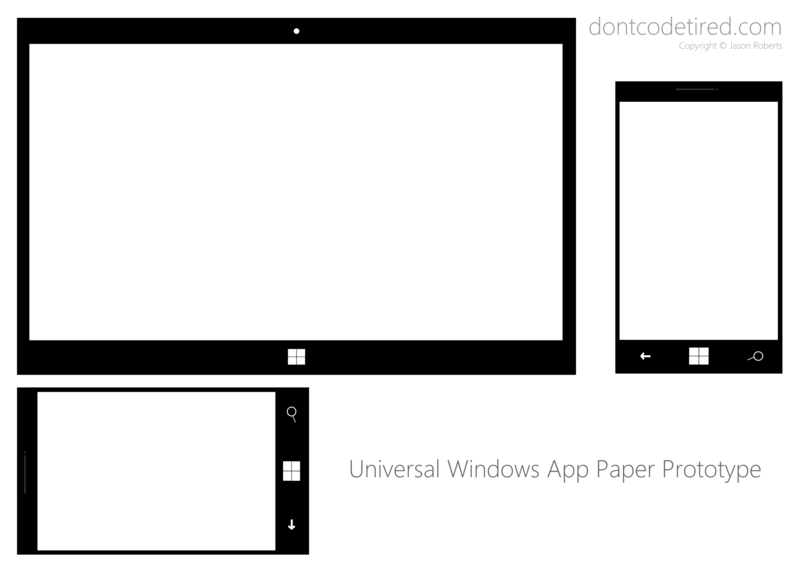 In honour of the announcement of universal Windows apps, I though I’d create a simple one page paper prototyping template to visualise what an app would look like on both a PC/tablet and a Windows Phone. This template compliments my previous Windows 8 paper prototypes. Currently the Timer class is not available when targeting both Windows Phone 8 and Windows 8 Store Apps. For the app I’m building I want the MVVMLight PCL ViewModel to update a property every second – the databound View then simply updates itself. One solution is to implement your own Task based Timer as described in this Stack Overflow article. Another approach could be to make use of Reactive Extensions Observable.Interval method to create a sequence that updates every n-seconds. First off add the Reactive Extensions NuGet package to your PCL project. I’m using SynchronizationContext.Current because the TimerTick method (below) updates the ViewModel property, without this there is a thread access problem. It’s however cool to know that Rx has portable class library support. 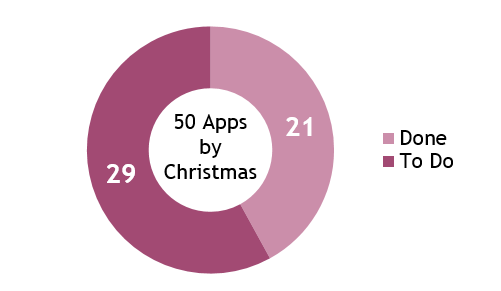 So I’ve been running this series: 50 Apps by Christmas. Currently I’ve got 29 new apps to create before Christmas 2013 (next week). As I’m not going to hit this (my book has been a higher priority) I’ve decided to roll it up into a new self-challenge: 100 Apps By Christmas 2014, I’m going to call it “A Year Of Apps”. This means I’ve effectively got to develop 71 new apps in about 53 weeks!! 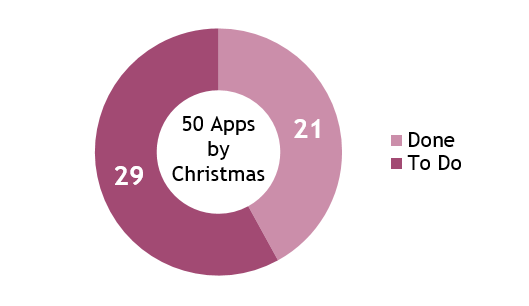 This article is part of the 50 Apps by Christmas series. As part of the (Australian) Appreneur challenge, I created 6 apps – the same 3 apps, but for both the Windows Phone Store and the Windows 8.1 Store. These are each available in the Windows Phone store and Windows Store. Say Stuff and Sleepyhead Power Nap both use text-to-speech capabilities which I’ve already written about. Both these apps were low in complexity so a simple code-behind model was used rather than any MVVM style. 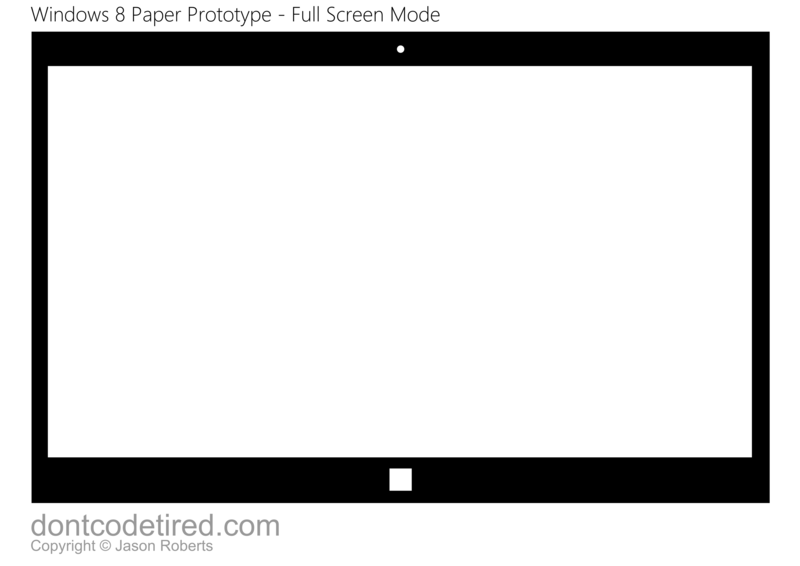 These are updated paper prototyping templates for Windows 8.1 Store apps. The changes from the previous 8.0 versions are mostly to do with the removal of snapped and filled modes in Windows 8.1 Store apps; there are new versions for the new default minimum width of 500px and also for the optional minimum width of 320px. Windows 8.1 adds the ability to perform text to speech using the Windows.Media.SpeechSynthesis namespace. You can specify a different speech voice by setting the SpeechSynthesizer’s Voice property. To get a list of all the installed speech synthesis engines voices that are on the local machine, you can use the SpeechSynthesizer.AllVoices property. In the example below, we loop through all the installed voices, and ask them to say “Hello World” followed by their names (DisplayName). With Windows 8.1, font characters (glyphs) can now contain coloured layers. In Windows 8.1 this behaviour is different by default. Windows 8.1 allows users to resize Windows more freely than Windows 8.0. In Windows 8.0 there was the concept of snapped, filled and full screen viewstates. These concepts are no more in Windows 8.1 apps. Depending on how you designed your app you may have more or less work to do; for example if you used a lot of fixed widths and positions you may have to adopt a more “responsive” layout strategy. If your existing app is more or less responsive already then you’ll probably have less work to do. 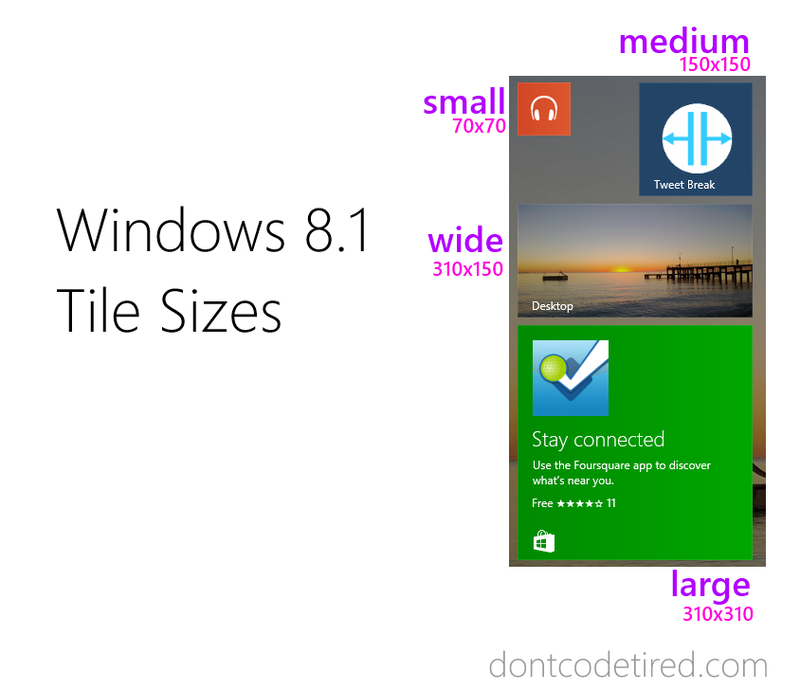 Windows 8.1 introduces two new tile sizes (small and large). This illustration shows the differences and the new names (small, medium, wide, and large). For more info check out this MSDN article.